The most difficult task for a company or organization employer is to layoff the staff workers of the company. A layoff letter is used when a company needs to terminate an employee for reasons that were not directly caused by their own action or performance. Layoff letters, thus, are used by employers to reduce the number of staff and employees for many reasons. A layoff letter should clearly inform the employee that they have been laid off, and explain their next steps regarding benefits, pay, company property, and the last day of work. For an employer to write a layoff letter, there could be many reasons. Some of them are economic and social factors which demand them to write a letter like this. So, the most important part of writing a letter like this is to is be as courteous as possible. The letter is very much serious in its content must be written by people who have an early experience in writing official letters since there are many legal issues that might come under this. So if you do not know how to deal with a letter like this, then it is better not to write it. This letter is also helpful in showing your love towards the employees, though they are going through the layoff situation which makes them realize that you care for them. 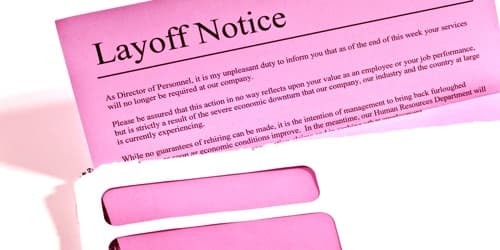 If you are preparing to lay employees off, be sure to have an attorney review your layoff plans, as well as your letter, to avoid legal risks. As this is not an easy situation for them, a kind approach is always preferable. As you know, the business has been struggling (reason for the letter). In our efforts (efforts made by the company) and unfortunately your position is being eliminated, effective (date). (Describe in your own words). We encourage you to express your opinion about the same, and if you require any help, you are always welcome to approach me. The payment that is due will be reached to you on or before the last day of your working with this company. (Explain the actual cause and situation). The insurance company will contact you for letting you know about their procedures on this matter. You have been a valuable member of our team, and we deeply regret the (reason for the layoff). All the best wishes to you, (Describe your requirements) and we believe that you have every confidence that will help you find a position that brings you personal satisfaction and allows you to use your talents efficiently and effectively. How do Pyroclastic Flows cause devastation?